Well, its about the hardest thing I hear from meat eaters to give up - bacon. The salty/crispy/smoky flavor is something that Americans (and I think a lot of others) seem to just be obsessed with. I haven't had any in a couple decades, and I'm still kicking haha. Why? Because I designed a perfect replacement to your bacon needs with rice paper. I'm not the first to attempt rice paper bacon, but I guarantee you there isn't a better rice paper bacon recipe on the market. I've worked on this for years to get the marinade just right. Best part about your rice paper bacon? Besides amazing flavors, it has insane versatility as well as has NO CHOLESTEROL. We've featured it in a number of recipes here already - BLTs, Breakfast Bagel Sandwiches, and even a Southern' favorite, Hoppin' John. There are two keys to making this work - marinade and cook time. The marinade is measured just right for you to make wonderfully flavored vegan bacon. The crispiness comes from the oven. We'll bake this dish for about 8-10 minutes at 400F. I always check it at 8 minutes to see where I'm at. My oven is like 9:15 to get it perfect. IMPORTANT - your bacon crisps a bit more once out of the oven. Don't let it go past 9-10 minutes as it will burn super fast. If you have a convection option on your oven, definitely use it and the bacon turns out even better but needs about 30-60 seconds less cooking. Alright well its time for the salty, crispy, smoky, yummy, taste bud explosion of flavor rice paper bacon!!! 1. 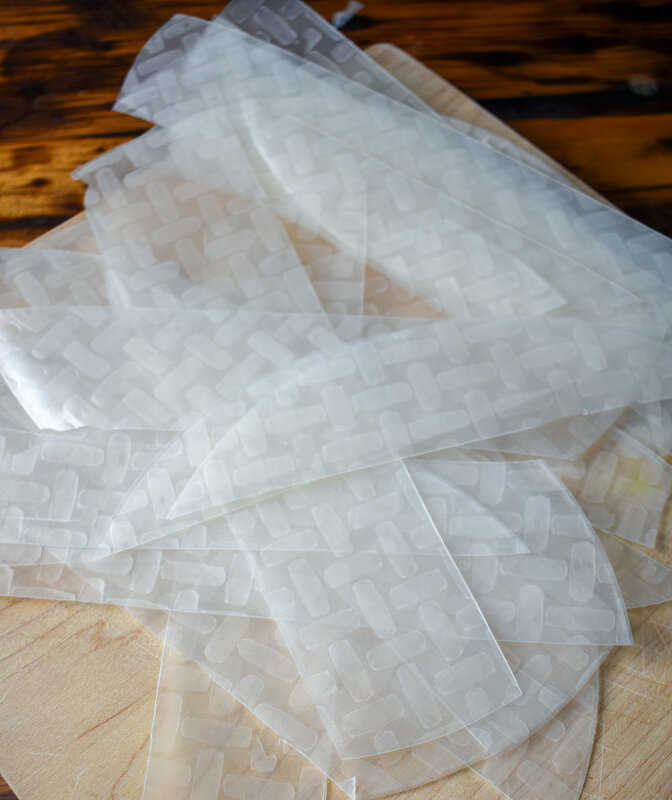 To start, using a sharp knife, cut 5 strips about 1.5-2 inches out of each piece of rice paper. Out of 10 sheets of rice paper, you will get about 45-50 pieces. If the paper is cracking, flip it and make your angle higher with your knife as well as try and use a sharper knife on a firm cutting board (wood preferred). 2. Don't worry too much about the width of the bacon pieces. When you are done, you'll have a large stack of varying pieces. 3. To form, find two like pieces of rice paper and stack them together. I like to stack all my pairs on a parchment sheet before wetting. 4. Holding the pair together, dunk it in a bowl of water and as you bring out of the water run your fingers down the sheets to remove excess water. Place onto parchment paper. 5. All your pairs should be wet and formed together on your parchment sheet. You may need a second baking sheet lined with parchment paper depending on how large your baking sheet is. 6. Next, mix together your marinade. These are the ingredients below rice paper. 7. To marinade your rice paper, use a kitchen/pastry brush to coat with a healthy layer on each rice paper sheet. Dab your brush in once and remove for each side. Once your first sides are done, gently flip the bacon pieces and marinade the other side. If you have marinade leftover, keep adding more to the sheets till its gone. 8. Bake the rice paper at 400F for 8-10 minutes. Check it at 8 and if its crispy remove. I remove mine at just over 9 minutes nearly every time. Watch closely to make sure it doesn't burn! 9. Enjoy! Serve it up with plenty of favorites like BLT / Tacos / Breakfast Sandwiches and many more! Aug 22 The Ultimate Vegan Breakfast Burrito w/ Crispy Hash Browns + Vegan Bacon, Turmeric Tofu Scramble, Lime Corn Guac, and Chipotle "Sour Cream"